I am currently the head of woodwind studies at a Prep School in Hampshire and London, teaching Clarinet, Flute and Saxophone as well as running the school jazz ensemble and wind ensembles. As well as an extensive private teaching rota I also find time to run a weekly amateur rehearsal big band and am involved in many professional jazz and classical ensembles, including “The Regular Joes” (11 piece swing band – Musical Director), The Jazz Police (Jazz Quintet – Musical Director), various duo and trio work. My Classical and Jazz recitals have seen travel all over the world, to countries such as Holland, Germany, Russia, Czech Republic, France, Cyprus, Spain, Switzerland (The Montreux Jazz Festival). I have played with The Taverners Big Band, Swing Unlimited Big Band, Soul Intention, The Jive Aces, Harry Skinner, various musicals (pit band), the list goes on…. 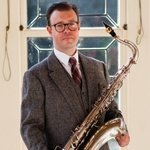 After attending Homefield School (on a music scholarship), I attended the Royal Academy of Music (Classical Saxophone Scholarship) and on returning to Bournemouth began his teaching practice as well as being a founder of Swing Unlimited, a community based organisation providing Jazz education to the surrounding area. This in turn led to regular jazz improvisation courses held at the Coda Music School, which I ran and directed. More recently I have been lucky enough to be involved in various (Jazz Smart) Workshop projects with Andy Scott (Sax Assault, Apollo Sax Quartet, Royal Northern College of Music). I teach privately from my studio in Bournemouth and have a varied mix of students from 8-70+ years young. I am happy to tailor lessons to your needs or requirements. I am CRB checked a member of the Musicians Union and have 20+ years of teaching experience in groups and one to one lessons and workshops. I am experienced in most styles of playing and encourage my pupils to follow ABRSM Classical or Jazz Exams. Having said that it is not imperative that you take exams….